On the morning of February 21, 1915, whistles were blowing and spirits were high; it was opening day of the World’s Fair. Seated at the Exposition Organ’s console was the fair’s official organist, Wallace Sabin. With a large chorus and orchestra, Sabin opened the Panama-Pacific International Exposition with Handel’s Hallelujah Chorus. A lavish nine month program of musical entertainment followed. In addition to orchestral programs featuring the organ, daily recitals were given by some 60 of the nation’s leading organists. But none was more legendary than world famous Edwin H. Lemare. Lemare’s contract with the Exposition Company forced him to leave his pregnant wife behind in Liverpool just days before the birth of his daughter. In the midst of the Great War, Lemare braved a U-boat infested Atlantic ocean and arrived in America mid-August. 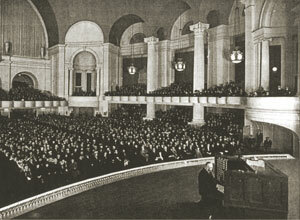 Despite the urgency to reach San Francisco on time, Lemare’s first recital was heard by only 400, a mere 10% of Festival Hall’s capacity. Attendance however soared once word spread that the greatest living organist was performing. Soon the concerts were sold-out affairs. The front rows were filled with organists who paid the 50-cent admission to the fairgrounds just to hear Lemare play. His wife, son and new born baby would soon join him in San Francisco. Nearly every day Lemare played at noon and again at 8:30 in the evening. Each performance with a different repertoire. At every concert Lemare improvised on themes sent up by the audience. His concerts became so popular that fair officials approved the expansion of seating in Festival Hall. By closing day, 18.5 million people had come to the fair and Lemare had played 121 concerts to almost 150,000 people. 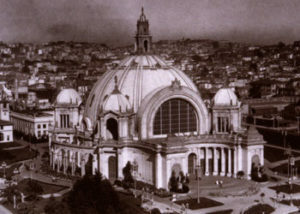 Unlike most world fairs, the Panama-Pacific International Exposition closed with profits. The Exposition Company decided to donate these unexpected funds to the City of San Francisco. A large building called Exposition Auditorium had already been erected in the city’s Civic Center. It, along with the Exposition Organ, were deeded to the city. Felix F. Schoenstein & Sons was contracted to dismantle and reinstall the instrument in the new Civic Auditorium. The dismantling process began two days after the close of the fair. Lemare was contracted to supervise the revoicing and reinstallation.